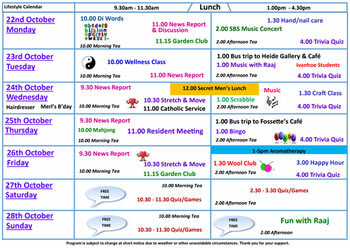 Hi does anyone have a Group Activity plan I can have a look at. Here's my program for this week. 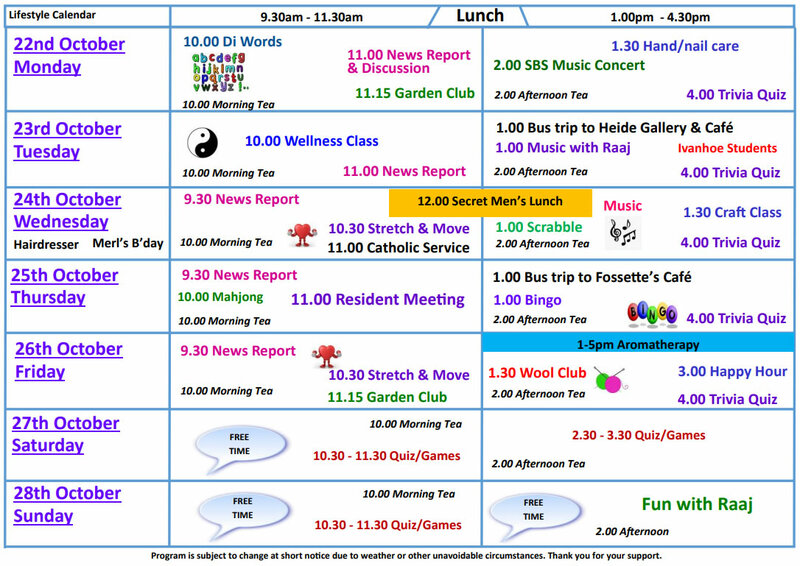 We usually have more music than this but we don't have any incursions on this week. Hope it helps. I am curious Chronos, what is your secret men's lunch all about? I’m thinking you mean the activity plan rather than the planner? I’ll see if I can screenshot one of mine tomorrow. It should give you a rough idea of proposed outcomes and also the list of steps to achieve the outcome. If you meant the planner instead, we have a full planner but very simply laid out. I can screenshot this again tomorrow for you. We follow the Montessori approach which also has identified black font on yellow paper is more helpful for residents living with dementia to be able to read. Our name badges are also black font on yellow backing.